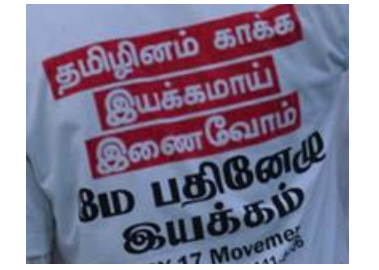 If the people of Tamil Nadu are vigilant enough of the nature and aims of the geopolitical forces operate in the region, then they will realise that call for independence of Eezham Tamils should get priority over war crimes investigation and indictment of Mahinda Rajapaksa, said Mr. Thirumurukan Gandhi of the May 17 Movement of Tamil Nadu, while discussing the UN report in Chennai last month. The whole world, except Tamil Nadu, knows that the power to change the paradigm lies in Tamil Nadu, he further said. 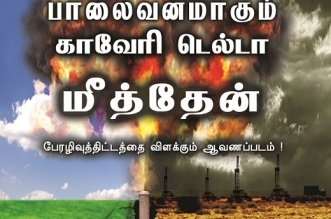 Thirumurukan’s analysis coming from grassroot thinking in Tamil Nadu was refreshing, while ‘analysis groups’ in Chennai and some international organizations backed by establishments aiming to capitalize the war crimes to their interests truncate the ultimate justice of liberation to the affected, said political observers in the island and in the diaspora. Geopolitical analysis or regional political analysis of quality was rarely made from Tamil perspectives in Tamil Nadu in the past. Such analyses were always a monopoly of a so-called ‘national’ minded clan and their media in India. Much of the sufferings of Tamils in India and outside, and the diplomatic woes of India in its southern flank were due to this lacuna, as analyses coming from Tamil Nadu perspectives meeting the rigours of international norms were never highlighted or they didn’t come at all, rising above the din of empty political rhetoric. The way a new genre of Tamil analysts discussed the UN panel report last month in Chennai was very refreshing, amazingly transparent in the content of truth and casts away conventional analyses or psy-ops coming from enslaved universities, funded organizations and intelligence-operated strategic ‘think tanks’ into dustbin, commented an academic in Jaffna. The most dangerous of the ‘analysis campaign’ after the genocidal war in Vanni is shedding crocodile tears for the war crimes to get political acceptance to post-war agendas, but refusing to examine why the affected should not be liberated and independent. If successive constitutions since British times and post-British times have failed for more than a hundred years on the national question in the island, and if the logical end has reached the point of genocide, then there is no point in accusing the implementation of the present constitution or harping on constitutional reforms. There is something wrong with the very existence of this state as a single unit. When the very word ‘Sri Lanka,’ ever since its constitutional inception, is associated with a genocidal state, anyone with common sense could tell why the Tamils can’t be ‘Sri Lankans’ in the island. Saying, “Tamils can be Sri Lankans” at this stage is only another way of putting an agenda to exterminate the nation of Eezham Tamils in the island. 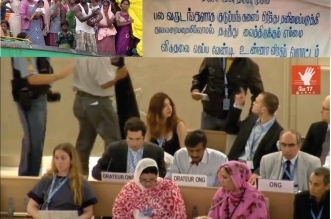 Why don’t the political science pundits who always think of power interests tell us what global or civilization-benefits are there for humanity by Eezham Tamils not claiming their independence even when they face genocide, the academic in Jaffna asked. 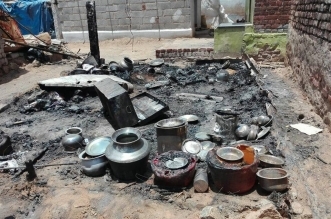 Raman and Hariharan have lost the credibility with the war ending in genocide. So, there will be another set of analysts with seemingly new paradigms but with the old agenda, the academic further said. The investigation on war crimes, covering all those who were involved with the crimes, is a responsibility of world humanity primarily for its own sake, if it wants progress from the suffocating state and power system of today. Even after becoming two states the Eezham Tamils and the Sinhalese have to strike reconciliation on their own, for their own survival in one island. But anyone concerned with war crimes or reconciliation today cannot pretend ignorance that neither a genuine war-crimes investigation nor genuine reconciliation is possible when the Eezham Tamils don’t have independence first. The responsibility of Tamil Nadu, based on Tamil perspectives, which Tamil Nadu alone could do, is more than identifying itself with the global responsibility of war crimes investigation. The government of Ms. Jayalalitha may have taken carefully calculated initial steps in the right direction, but it should not be deviated by vicious forces that have a record of doing mischief in the region is the concern of global Tamils. 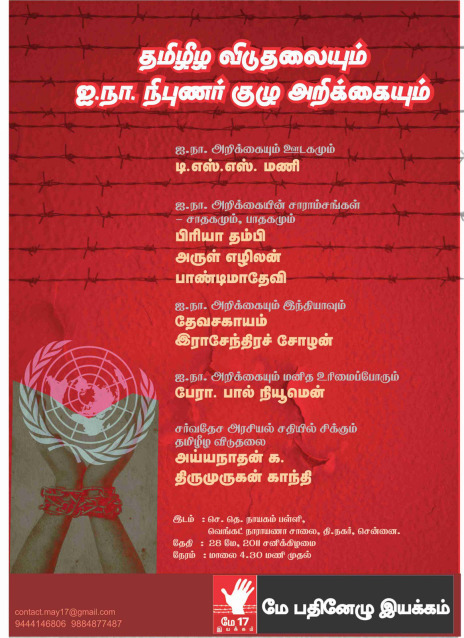 Thirumurukan Gandhi, K. Aiyanathan, Prof Paul Newman, Devasahayam, Rajendra Chozhan, Priya Thampi, Arul Ezhilan, Pandimadevi and DSS Mani, who have discussed the UN panel report in Thiyagaraya Nagar, Chennai on May 28, have boldly and explicitly brought out the intriguing aspects that affect affairs from moving in the right direction and what Tamil Nadu should do about them. 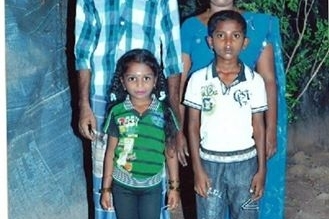 Such analyses should also reach the outside world for the benefit of global public opinion, the Jaffna academic commented, adding that with such quality of awakening and new thinking, the next generation of Tamil Nadu cannot be taken for a ride or be contained by anyone, without yielding into aspirations that are righteous. There was genocide before the war and there is genocide after the war. Before there was a militant organization to counter it, now there is nobody. The genocide that takes place after the war needs our full attention. Tamil Nadu should be aware of its geopolitical importance to take right moves, while the land of Tamils is fast becoming another Afghanistan in South Asia. China that sets the String of Pearls and aspire for Blue-water Navy and the USA that now orchestrates regime changes to save its image and to control Chinese inroads are not really against each other. They only practice containment and in the process people perish. Ilangkai (Sri Lanka) is in the highlight now as it is going to set the trend elsewhere. The next in line is the Karen nation in Burma. The US and the EU broke the peace talks in the island. The US knows all what had happened during the war. There was close understanding between the US and the Rajapaksa regime and the US gave arms to Colombo through Israel. The US needs the entire east coast of Sri Lanka. Corruption is a weapon to bring in instability and corruption is encouraged to bring in instability. Corruption cannot be the cause for revolution but revolution can have corruption. The popular uprisings in the world, including the Jasmine Revolution in West Asia and North Africa are planned and hijacked by the US, only to change the leaders and to escape the anti-US sentiments in the world. They prepared Rajapaksa to destroy the LTTE. After the LTTE, Rajapaksa is not needed and the powers now bring in the war crimes investigation to ‘punish’ him. Rajapaksa is not our concern, but Tamil Eelam is our concern. Our fear is whether Tamils will get their justice. The US is known for differentiating punishment to the ‘criminal’ from delivery of justice to the victim. 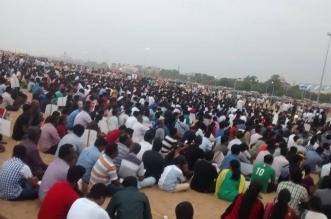 The political replacement that took place in Tamil Nadu is analogous. 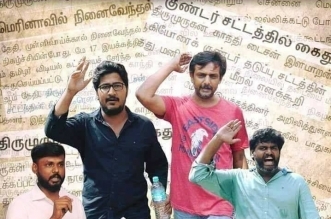 They need some one acceptable in Tamil Nadu to endorse their agenda. All except Tamils know that Tamil Nadu is the key factor. The West may now hand over the task of ‘political solution’ to India. As it does now and then, India will dust the 13th Amendment. There are three Tamil entities to handle. 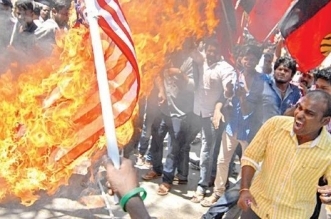 The Tamil National Alliance (TNA) in the island will be handled both by India and the USA. Whatever they impose in the island should find endorsement in Tamil Nadu. As Karunanidhi has lost the credibility there should be some one else who could evoke hopes in Tamil Nadu. Tamils need to be watchful. Tamil Nadu has already gone into global politics. When the Tamil Nadu State Government is handled, there will be no one to raise voice in the Assembly. The Communist Party of India (CPI) may talk, but it too looks at the issue within the framework of a ‘united Sri Lanka’. Vaiko was purposefully sidelined earlier and now, as there shouldn’t exist anyone within the Assembly to raise the name Tamil Eelam. The third entity, the diaspora and its committed section, is already pressurised heavily in many systematic ways in the West. When the stage is set, Rudrakumaran will be forced to accept what is set by the agenda. When the BBC and the CNN blare out the virtues of the solution, the voices in Tamil Nadu will be feeble. Our support to the war crimes investigation of the UN should be conditional. The UN panel report is incomplete, as it has not recognized the genocide in the island. Merely a regime change effected by the war crimes investigation cannot bring in lasting solutions to Eezham Tamils. 2,50,000 Tamils have been killed in the war of decades. Accepting wanting solutions is not doing justice to the killed. Like SJV Chelvanayagam was firm in 1976 in Vaddukkoaddai Resolution calling for Tamil Eelam, like Pirapaharan was firm in 1987 against hoodwink solutions, Tamil Nadu has to be firm now. The war crimes the UN now speaks of, is not an isolated event. The root has to be addressed and answered. Governments in India and Sri Lanka always set the agenda and we in Tamil Nadu only respond to passing events of the agenda. 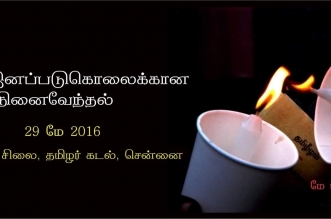 Immersed in immediate issues we fail to raise the voice for the fundamental issue – the independence of Tamil Eelam. Eezham Tamils have democratically mandated the Vaddukkoaddai Resolution and have re-mandated it in the diaspora recently. War crimes investigation may be welcomed. But, without the recognition of the genocide and without the recognition that a national question was the reason, the investigation is meaningless. Let those who don’t agree conduct a referendum through the UN and see.